Crop diversity can be conserved and shared. Scientists know how to do it and at a very limited cost to the world community. It requires global leadership and stronger partnerships and the building of capacities of scientists in the developing world. 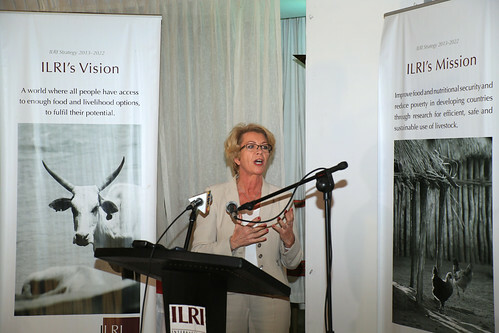 No country is self-sufficient; successful breeding is highly dependent on functioning multilateralism, according to Marie Haga, executive director of the Global Crop Diversity Trust, speaking at a high-level seminar held 23 Feb 2016 at the Addis Ababa campus of the International Livestock Research Institute (ILRI). Participants at the seminar—Celebrating biodiversity in Ethiopia: a major centre of crop diversity—heard four Ethiopian and international experts outline the enormous potential of Ethiopia’s biodiversity and the importance of conserving global biodiversity: Eleni Shiferaw representing Gemedo Dalle, director general of the Ethiopian Biodiversity Institute; Marie Haga, Gebisa Ejeta, genetics professor at Purdue University and World Food Prize laureate; and Jimmy Smith, director general of ILRI. ‘Agriculture is probably facing one of its biggest challenges ever in its 13,000 years history… .’, said Haga. Jimmy Smith underlined the linkages between livestock and crop diversity, and international partnership and cooperation. He said the ILRI Forage Genebank has 18,000 collections and 1,400 species from 149 countries. In line with its international obligations under the International Treaty on Plant Genetic Resources, ILRI holds this crop diversity in trust to share it with those involved in producing food and agriculture. Over the years, ILRI has given out 13,000 samples to Ethiopians and thousands to other countries. According to Gebisa Ejeta, Ethiopia and Ethiopians had given and received a lot from the international community; few other African countries have benefited more from international assistance. The quality of the ILRI Forage Genebank, one of the best in the world, is down to the help from CGIAR, and past and present Ethiopian governments. Ethiopia has been home to 38 important crop species, many unique. This diversity offers the potential to adapt to the conditions facing us now and in the future. While there is the technology to adapt the genes, developing countries, Ethiopia included, need the institutions, capacity development, and effective partnerships. The Ethiopian Biodiversity Institute has collected and conserved more than 80,000 accessions of cultivated crops, forage and forest species in its genebank. However, it is not just a question of conservation for conservation’s sake, more than 160,000 accessions have been distributed to users to be utilized for crop improvement, Shiferaw said, eventually ensuring farmers gain access to these important crops. These days many argue we should reduce the number of livestock in the world to protect humans, the ILRI director general said. But using the forages in new ways, and managing the world’s rangelands better could contribute to huge carbon stocks, mitigating climate change. This sort of approach will help us make better animal systems. ‘Agriculture is probably facing one of its biggest challenges ever in its 13,000 years history. There are several reasons, but the main is the dual challenge of population growth and climate change. Producing sufficient, nutritious food can never be taken for granted, but it will be even harder in the years ahead’, said Haga. If food security were easy, we would have it by now, Haga continued. The complexities are all well understood. But no matter how you look at it, no matter what the complexities, one fact is certain, simple, and clear: crop diversity is a prerequisite for a sustainable food system which provides more, and more nutritious, food in spite of climate change. Read more about the high-level seminar at ILRI. Tags: Ethiopia Biodiversity Institute, Genebank, Global Crop Diversity Trust. Bookmark the permalink.